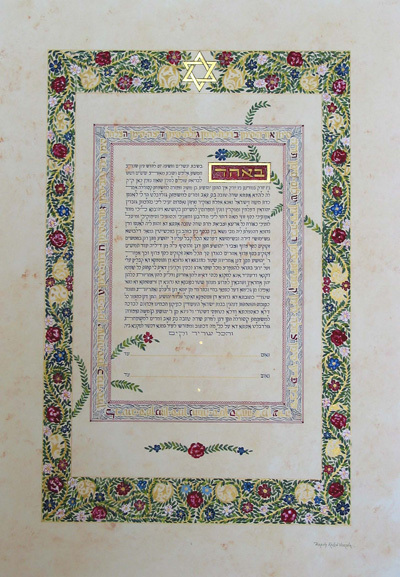 This Ketubah with Sephardi Orthodox text, is surrounded with two frames. The inner frame with SIMANIM (blessings for the married couple) is written in Hebrew in alphabetical order. The top of the outer frame is decorated with the Star of David made with 23K Gold Leaf (optional). The illumination is done with green leaves, colourful flowers, with gold paint and surrounds the inner frame. The first word of the Ketubah text is the date of the wedding, it is written with gold on a red background with a 23K Gold Leaf frame.